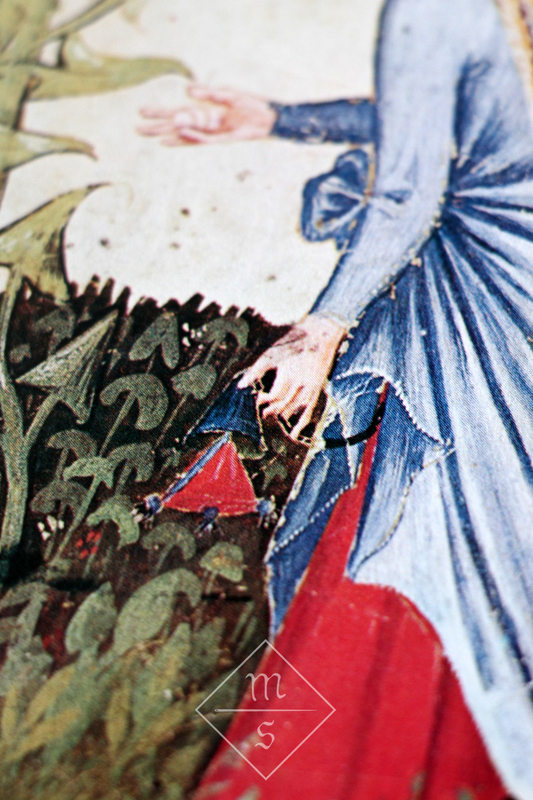 I've always been intrigued by this red and blue purse from Tacuinum Sanitatis (Tacuinum Sanitatis, Lombardy, 1380-1390, Paris, Bibliothèque Nationale, Ms. nouv. acq. lat. 1673, f. 43). As you can see the purse is made of a red fabric, with blue tassels and a blue drawstring. It hangs down from the woman's belt and on this hanging cord there is a blue purse cap that one can slide up and down. 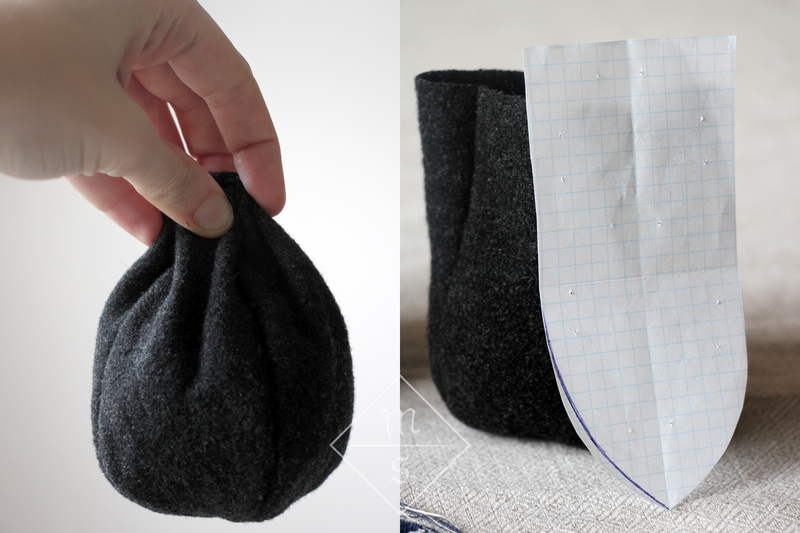 When I first saw it years ago, I had never seen a purse with a cap before. 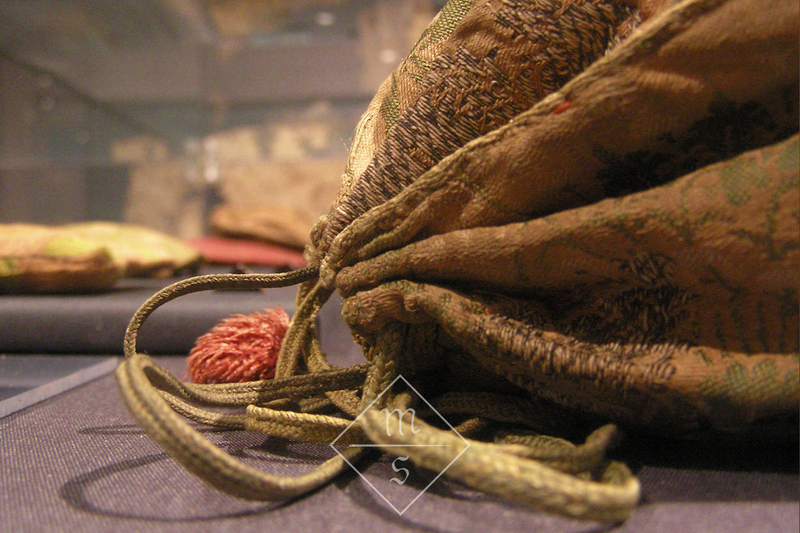 It all started to make more sense to me when a few years later I visited the Stadtmuseum in Cologne, where they have a purse cap and a purse with a netted cap in their collection (see more images here). I think that without the image from Tacuinum Sanitatis, I could have never guessed the function of this little thingy. It measures 8,8cm high and 8,4cm wide (which means that the individual panels measure 8,8cm by 4,2cm). 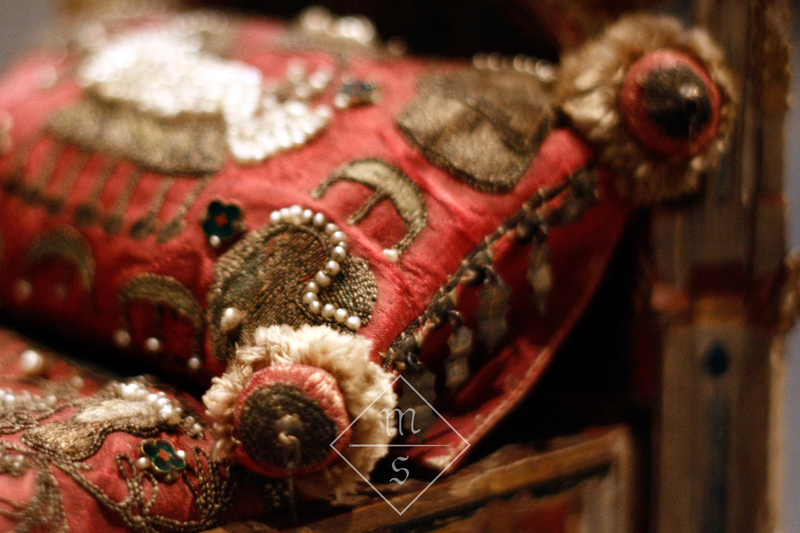 It is made from silk brocade and has a pink silk lining. The seams are covered with four-strand gold thread braids and on the top sits a wooden bead covered with needle lace/buttonhole stitch. Based on the weave of the lampas brocade and the type of gold thread in it, the authors of the museum catalogue (W. Schafke & M. Trierdate, Mittelalter im Koln, eine auswahl aus den bestanden des kolnischen stadtmuseums, Köln: 2010) date it to the fifteenth century. Because the purse cap from Cologne is made from four triangular panels, I decided to go with the same construction for the purse itself. A really lovely fourteenth century pouch in the collection of the Saint Servatius Church in Maastricht, Netherlands, served as my inspiration. This purse is made from Italian silk brocaded lampas. 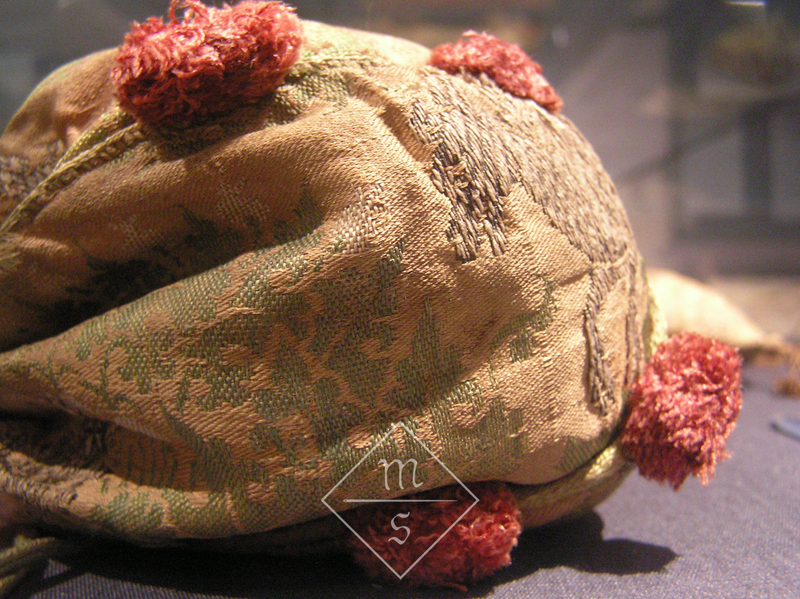 It has a leather lining, green silk tablet woven edges and red silk pompons. It measures 16cm by 18 cm, which means that the individual panels of the purse each measure 16cm by 9cm. 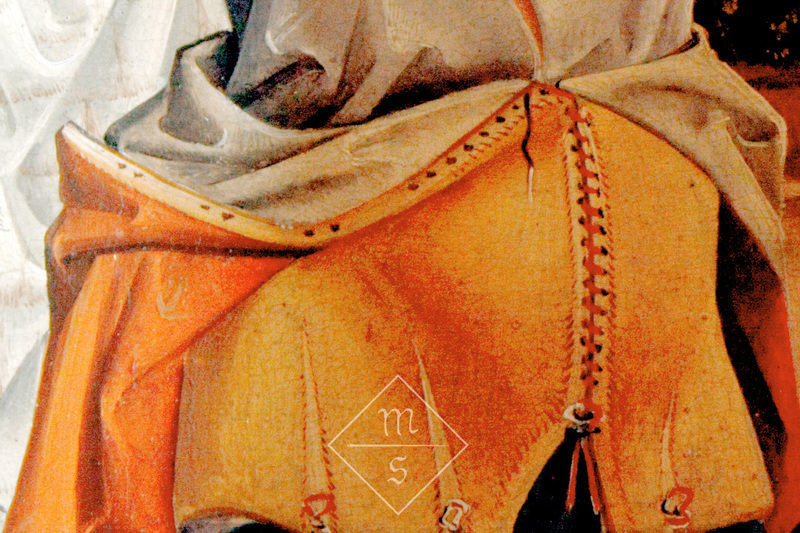 You can find more details here: A. Stauffer, Die mittelalterlichten Textilien von St. Servatius in Maastricht, Riggisberg: 1991. Even though the pompon tassels on the Maastricht purse are super sweet and strawberry like (the pompons on the drawstrings even have green needle lace crown leaves), I decided to go for another type of pompon this time. I saw some really lovely ones two years ago in the Metropolitan Museum. 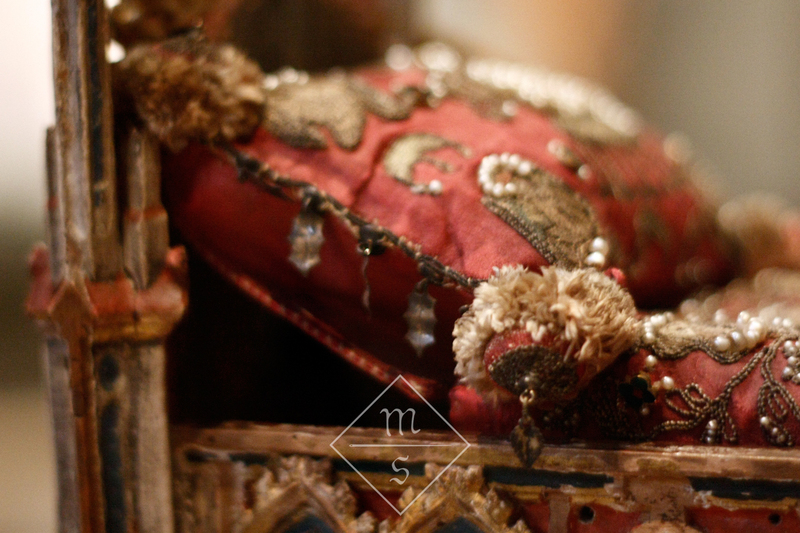 These amazing pompons with fabric covered wooden beads and leaf shaped charms are part of the Crib of the Infant Jesus, fourteenth century, South Netherlandish (propably Brabant), Metropolitan Museum, New York. 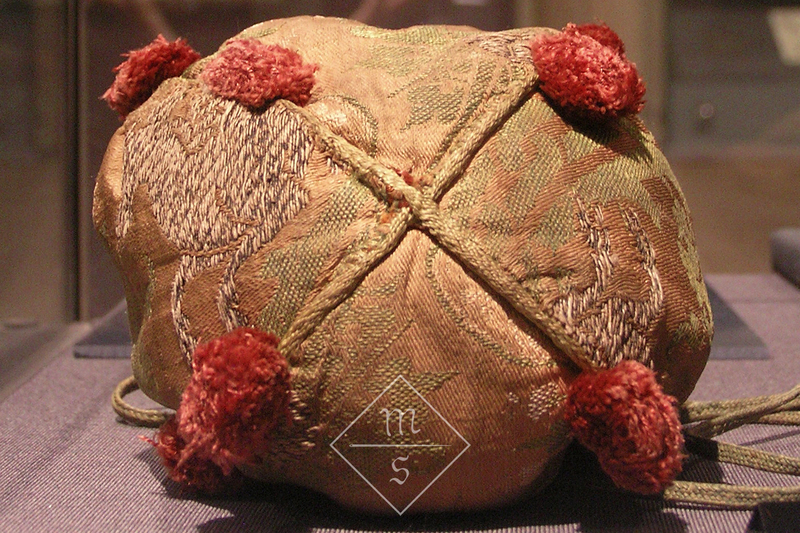 Similar pompons can also be found on earlier purses from the Low Countries, for instance on some of the purses from Tongeren.What I like particularly about the pompons from the crib's pillow is that they have a needle lace detail as well, to match the button on the purse cap from Cologne. The fabrics I'll be using for my purse burgundy red velvet (it's a bit darker as it turned out on the photo) for the purse itself and a brocade for the purse cap. 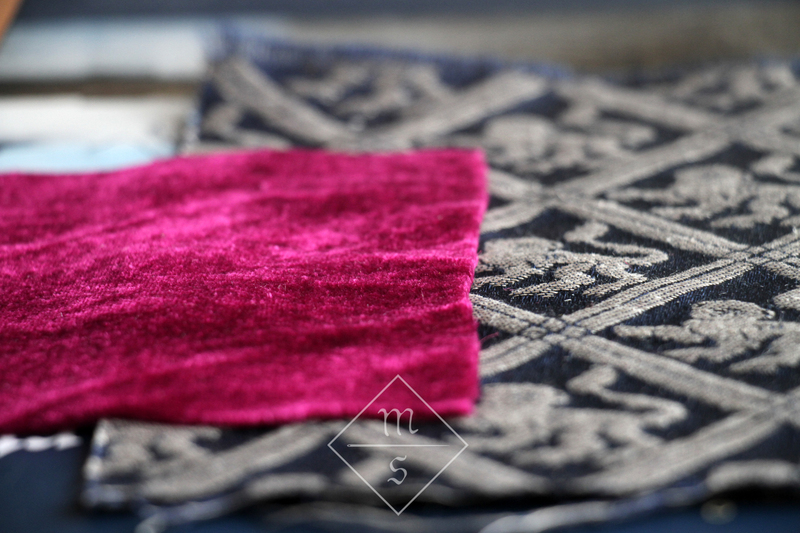 The velvet are a few scraps I got from a friend who made a fifteenth century houpelande in the same fabric. 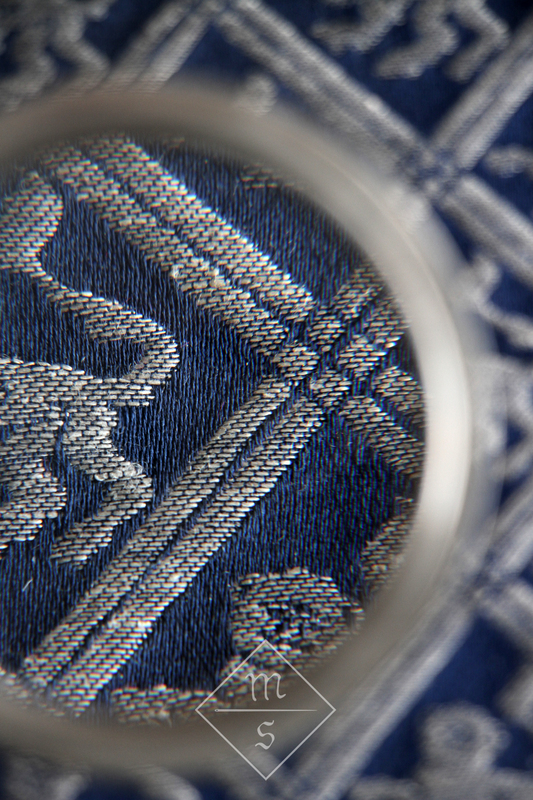 The brocade is woven from blue silk and natural unbleached linen and is from Historiska Rum. The fabrics was woven after a historical pattern to recreate the thirteenth century bedroom of Edward I in the Tower of London. The first step was to create a few prototypes. I have never made a four-panel-purse before, so I had to fiddle a bit with the pattern. First I made it way too short. The second try was better but the curve in the bottom was a bit too sharp, which gave the purse too much of a boxy bottom. My final purse panels each measure 12cm by 7cm. 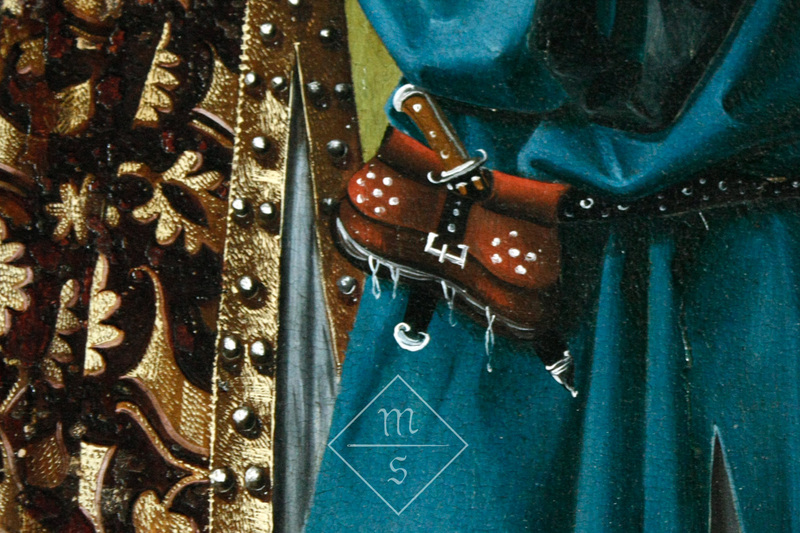 The proportions thus are the same as the purse from Maastricht, but just slightly scaled down. Because I only have a small piece of the blue brocade fabric, I couldn't make the purse too big. I changed the paper pattern piece to have a slightly gentler curve for the final version. 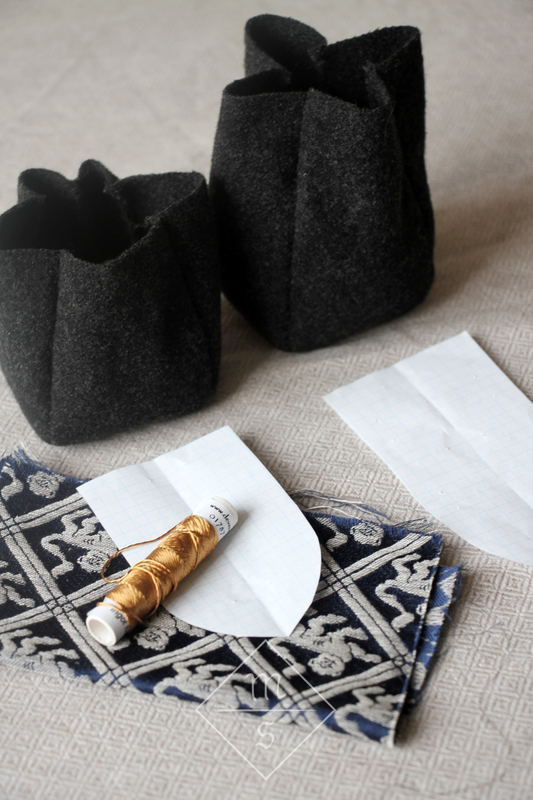 The next steps will be to make a pattern for the purse cap, to order silk thread for the pompons and drawstrings, and to assemble all the separate pieces. In this series, named after TtV photography, I want to share with you a work of art, be it a painting, sculpture, manuscript or drawing from my vast collection of museum visit images. 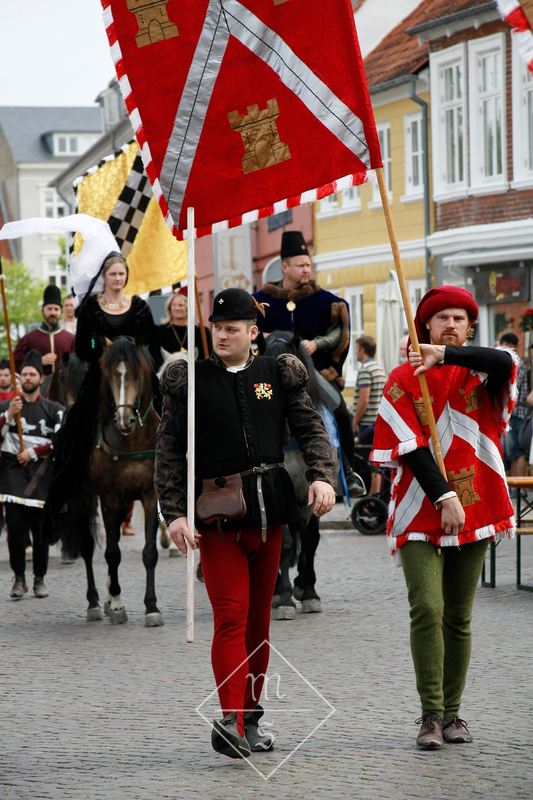 On our way back home from The Battle of Visby, 2011, we made a stop in the German town of Lüneburg. 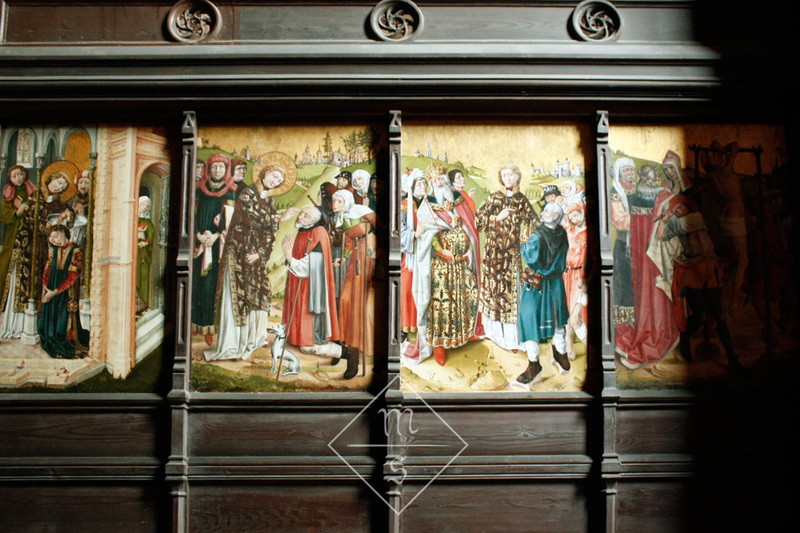 In the church of St. Nicolai we found this altarpiece (called the Heiligentaler altar) with scenes from the life or Saint Lawrence, dated c. 1445, and presumably painted by local painter Hans Bornemann. Originally, the altarpiece was made for the St. Andreas church in the same town. At an unknown (to me anyway) point in history, this church was demolished and the altarpiece was taken apart and moved to a new home. In St. Nicolai the panels were rearranged in such a way that they'd fit their new home, but with the result that part of the panels are no longer visible to the audience, and no longer in their original order. The four panels in this photograph show St. Lawrence at a variety of activities (from left to right), from baptising poor Roman sods such as Lucillus (1), healing a blind man (2), and showing emperor Decius that the poor were not a nuisance but the true treasure of the church (3) to being beaten with lead clubs (4). Look what arrived in the mail today! 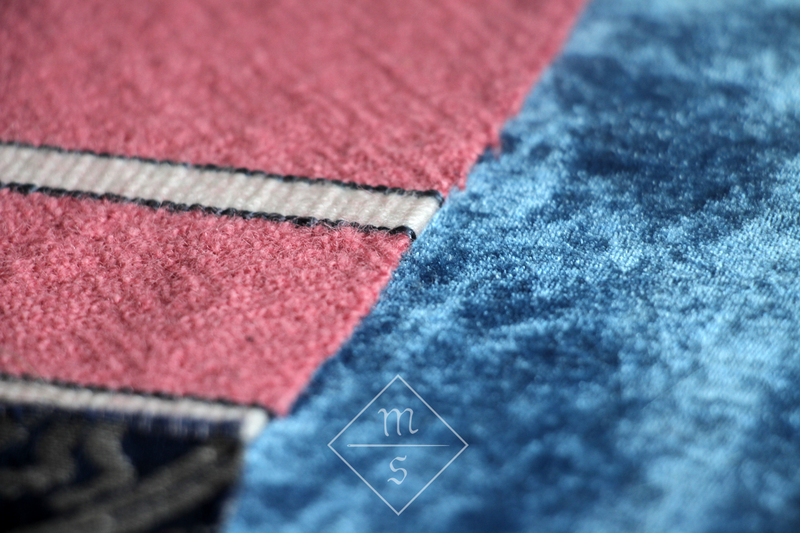 A sample of indigo dyed 100% silk velvet from Färbehof. Isn't it gorgeous?! I think it will look perfect with Maria's handwoven fabric. Together they will become the mi-parti overdress I talked about in my last post. Before you get too exited, the actual making of the dress will have to wait a bit. First I have to order the blue velvet and wait for Maria's weave to arrive, but also I should first make the red wool dress that will go underneath. That doesn't stop me from fantasizing about it though. 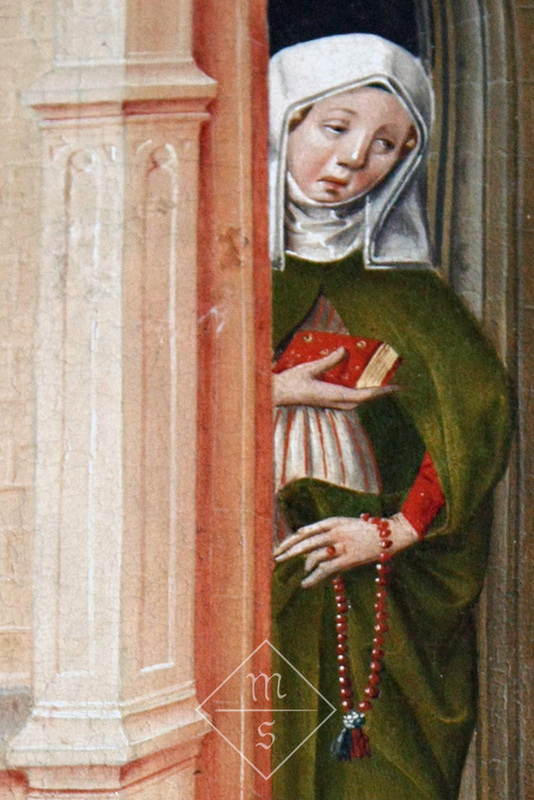 I would love to find some beautiful bezants to sew on the velvet, or maybe make some myself, if I find the courage to do so. The summer gone over and autumn has definitely arrived. The busy season is over. There is less work in the garden (even though that's where I spent the better part of this afternoon). There is more time to spend indoors, working on new projects. In the past few months I've collected fabric swatches for new outfits for me and the Mr. As you can tell from the image these outfits will be quite a lot fancier than what I usually wear. In the upper half of the photo you can see the fabrics for my outfit. 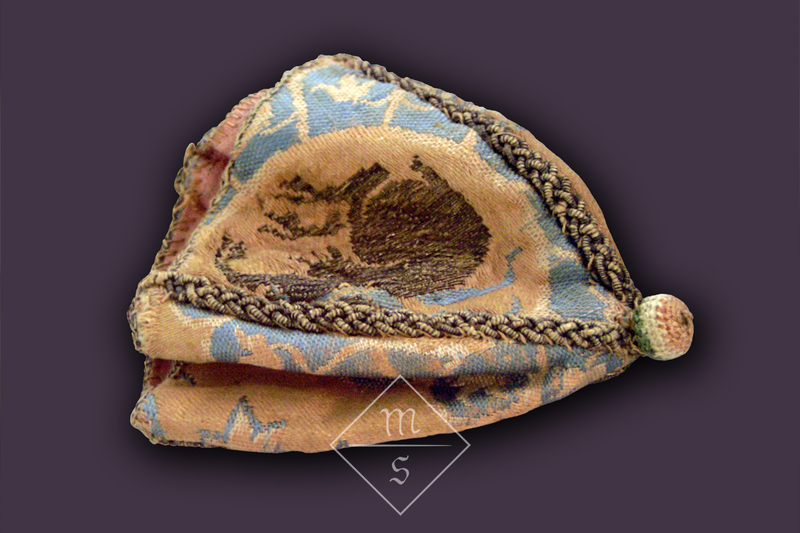 The blue brocade with lions and the burgundy velvet will become a purse. The brick stitch embroidery will get some tassels in blue silk to match and will be sewn into a purse as well. The little pink/red square is a fine twill weave that I will use for making a dress together with the brass buttons (it is a bit less pink in real). The yellow fabric is for hose, although I might change my mind about that still. 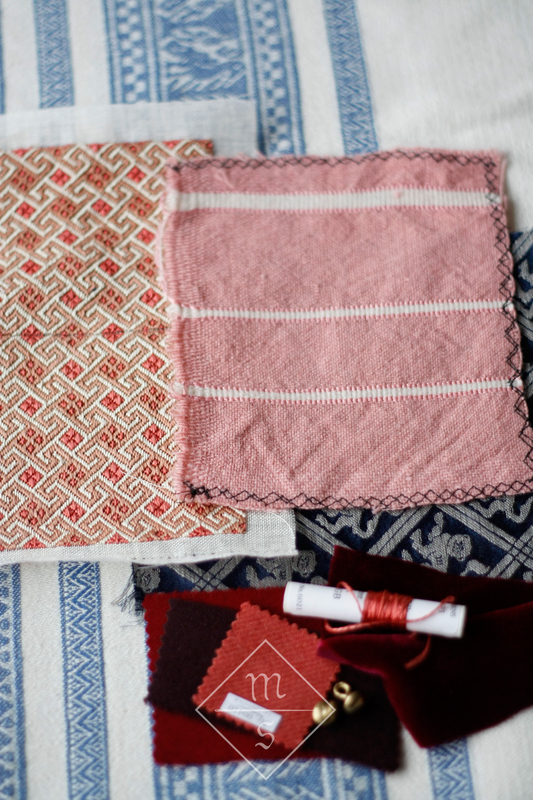 The two samples of pink striped fabric were try-outs handwoven by my friend Maria. 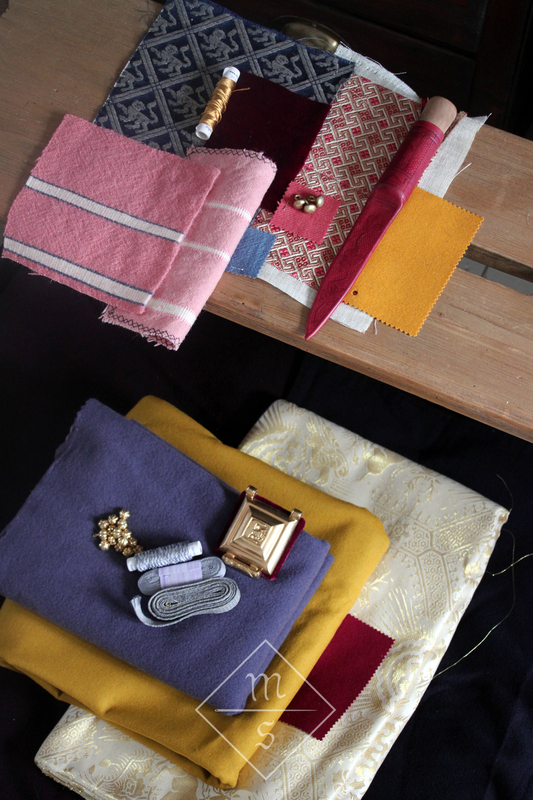 The final fabric will be in a paler pink (here you can see Maria's post on the weaving of the new piece). This fabric will become a mi-parti over dress with tippets. The other half of the dress will be in blue, hopefully velvet if I can find the right shade. I'll talk about the Mr.'s outfit another time, but the cherry red wool you can see in the bottom half of the picture will be the fabric for my hood. And here's a close up of Maria's amazing work. 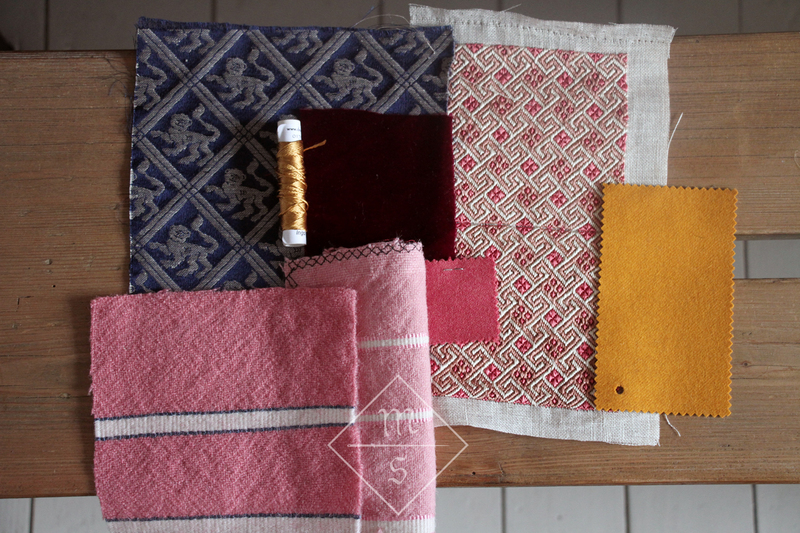 The pink and white are wool, and the woad blue is silk. 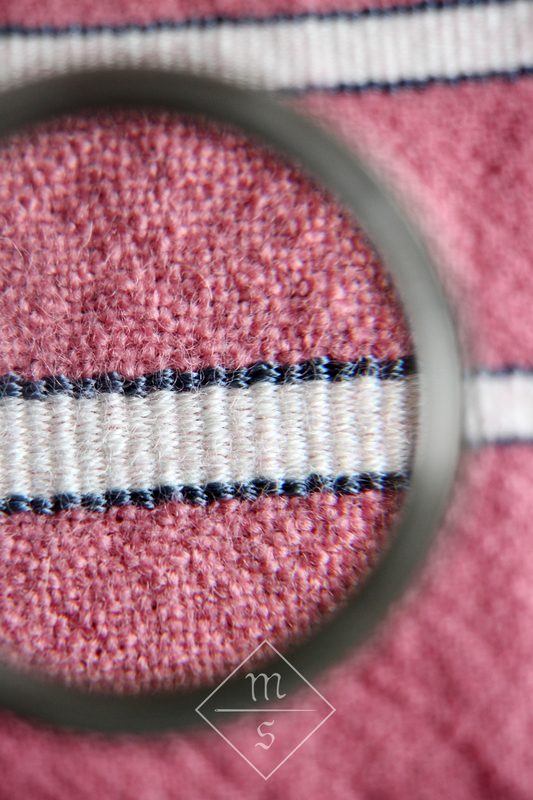 The weave is based on several finds from 14th century London. For as long as I've known about these finds, I've wanted to have some of this fabric myself and I can't believe that in a few weeks or months this will finally be true! About a year ago I fitted the patterns for twenty two journeyen, 'tunica sine manicis' or sleeveless tunics in one afternoon. I have never had so many men in my hands in such a short time slot ever before, I can tell you. 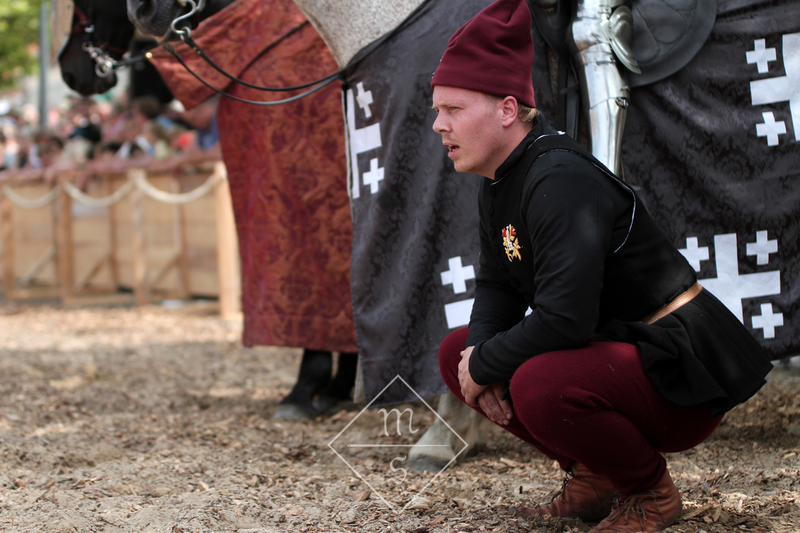 These journeyen were for the ground crew of Foundation Historic Educational Initiative (short: HEI) for their jousting display. 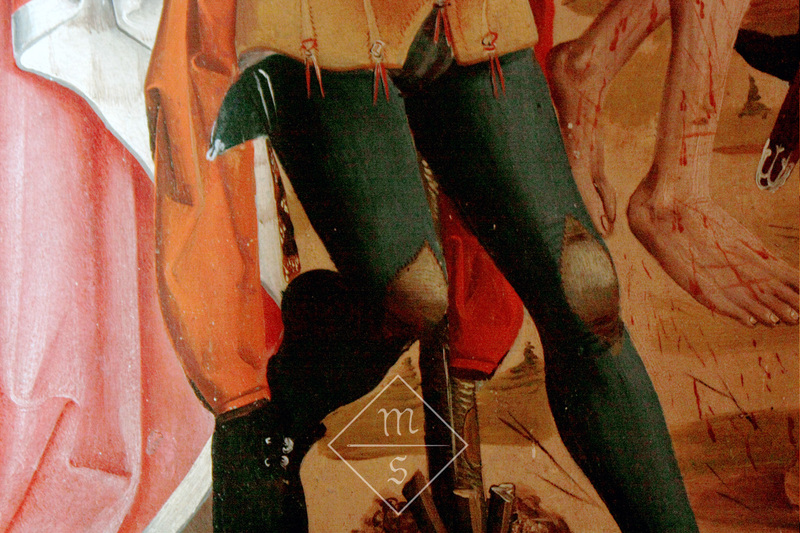 The Ceasar Tapestries (detail), c. 1460, Historisches Museum Bern. Thanks to Bertus Brokamp's research (the chairman of the foundation and accidentally also my boyfriend) I didn't have to do much else but pick my favourite example and recreate that. Bertus included a wide array of sources in his report, from written accounts to paintings, playing cards, and tapestries. I really liked the button closure on the playing card journeyes and the pleated skirt of the journeye on the tapestry above. We decided on black wool cloth for the outer fabric and bleached linen for the lining. Only the bodice was lined. The folds in the skirt are five layered rolled pleats to give them a good volume. The patterns were shipped to Poland, so that Gabriela Glinianowicz at Amictus could turn them into the finished journeyen. Another part of the production I had only a small role in, were the gold embroidered emblems that were stitched on the front and back of each journeye. The design for the emblem was made by Bertus (with some comments and suggestions from me here and there). 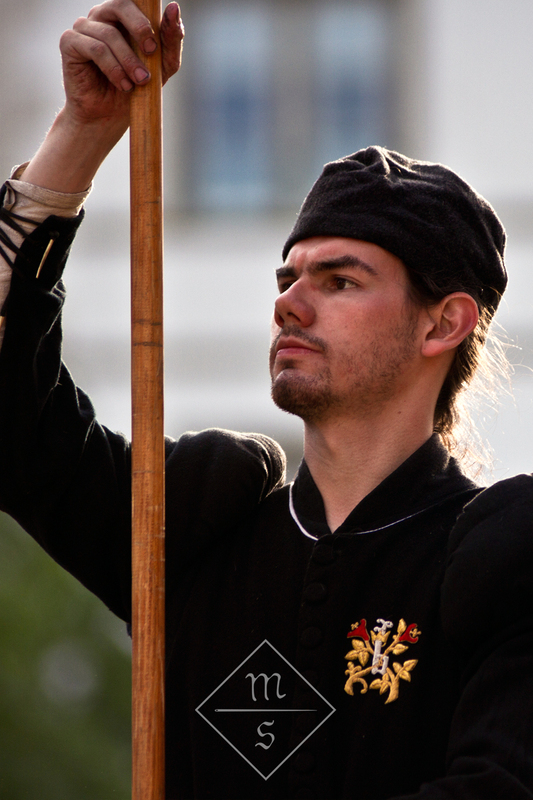 Since Foundation HEI portrays Bruges jousters, the crowned letter 'b' was incorporated into the design. 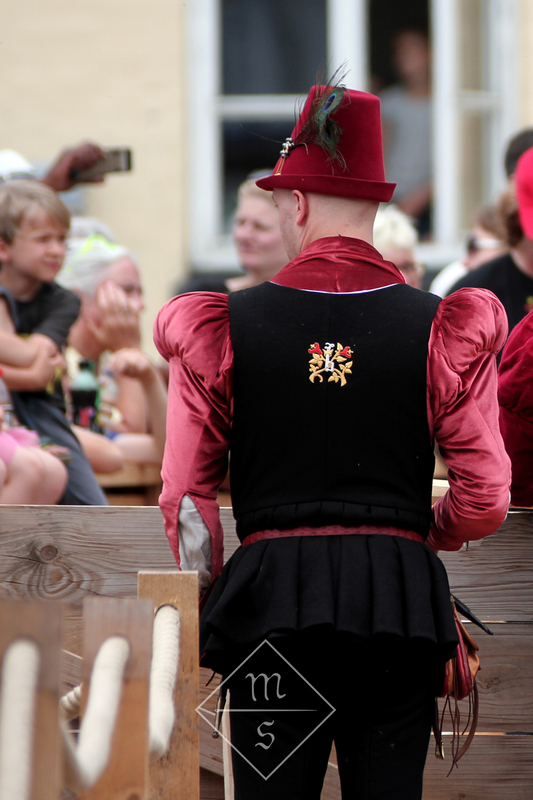 The crowned 'b' was used in Bruges on the livery of the city militia in the 15th century and orphans in the 16th century. It was also used as a quality mark in many guilds. 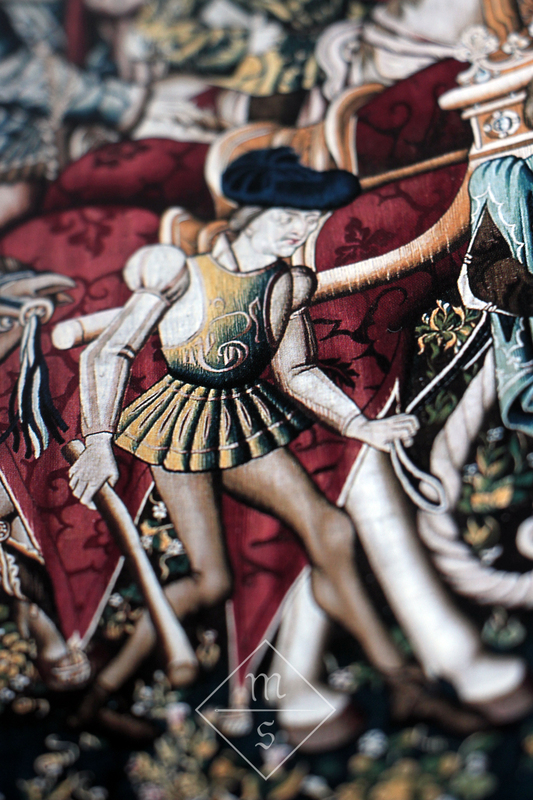 The floral motif is taken from a 15th century effigy of Joos de Bul, one of the jousters they portray. 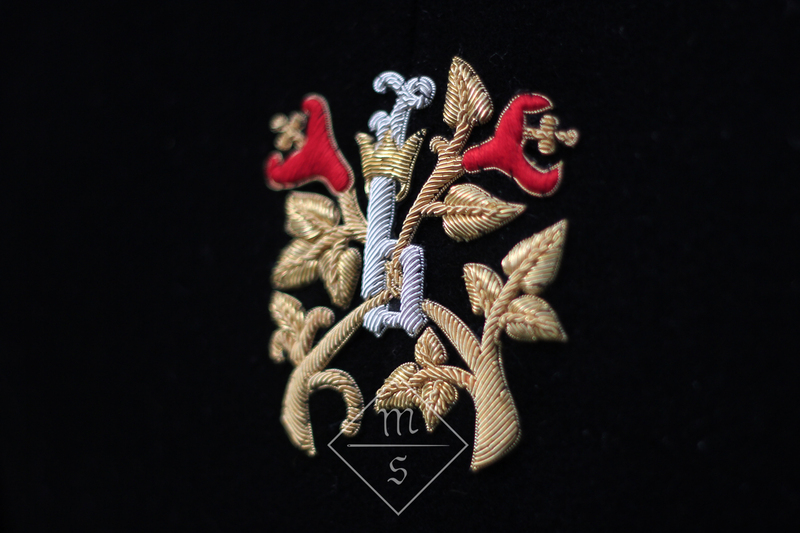 The badges were handmade in India by Badge of Honour using gold and silver bullion and silk thread. 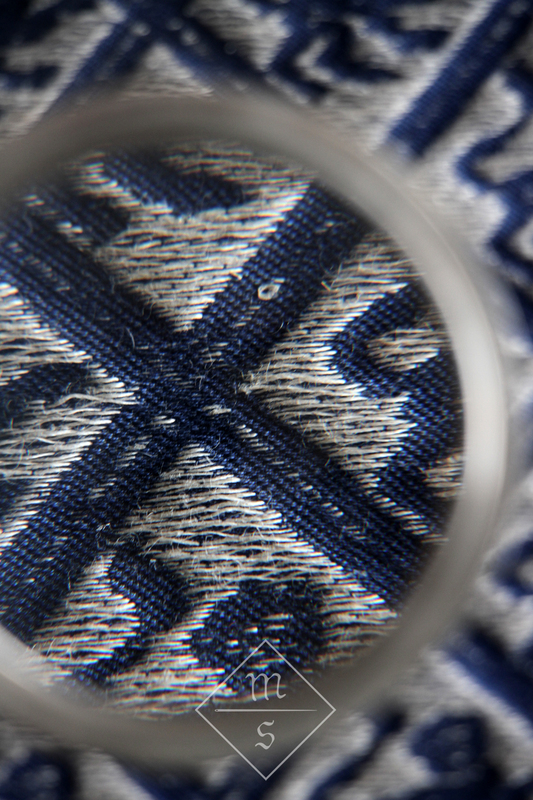 This type of embroidery isn't a 100% correct for the period, but it was as close as we could get on the budget we had to work with. I wasn't really up for embroidering 44 of the badges by hand either. The journeyes were first used in Nyborg, Denmark and then on several other occasions during the summer and autumn. 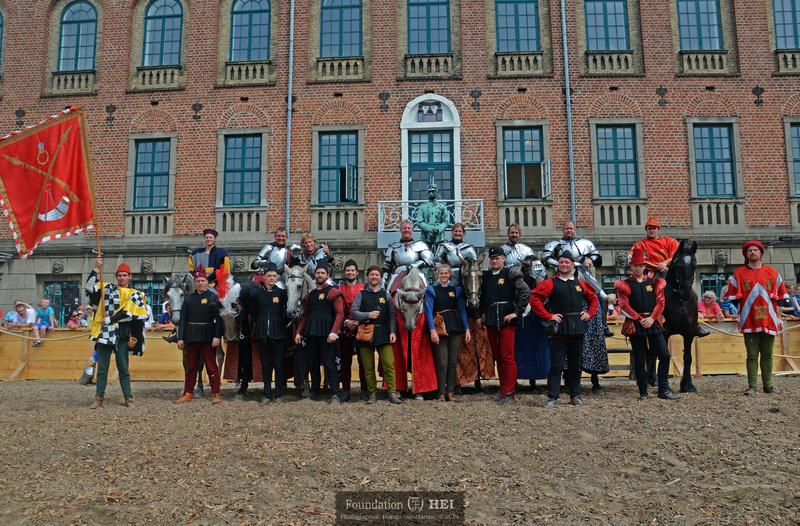 For a group shot of both the jousters and the complete ground crew, click here. 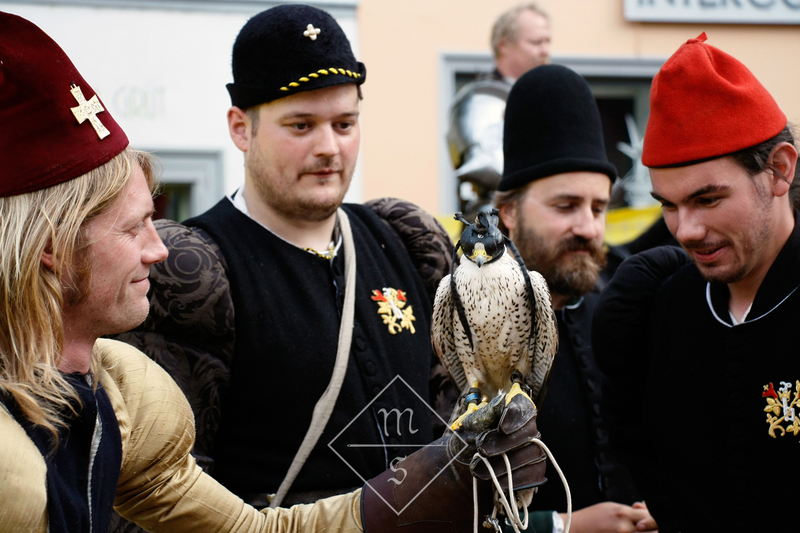 The photos in this post were taken by me at two historical tournaments this summer: the first in Nyborg, Denmark, organised by Foundation HEI, the other in Schaffhausen, Switzerland, organised by Arne Koets Events.